CNC, which stands for Computer Numerical Control, has been applied in the machine tool industry for several decades. The program lets you control aspects such as feeding speed, travel distance, and rotating speed. All of this required a great deal of experience to master. Furthermore, you need to possess a unique type of skill in order to use a CNC machine effectively. Nowadays, CNC machines are so popular that you will see them being used in most industries. But the problem is that they are still expensive compared to conventional machines and not all types of work are suited for this process. CNC machines are good for large-scale productions or work that involves numerous processes. In the stone industry, the polishing processes are primarily automated by CNC machines, which generate large slabs or slates of granite, marble, and travertine. After you input the required CNC machine tool and grinding settings, the machine will continuously churn out the granite or marble products accordingly. CNC machine tools require more accuracy and stability compared to the radial arm polishing machine. This is because the worker cannot adjust or change the polish settings during the process. 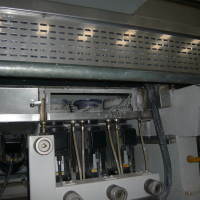 If something goes wrong with the tools, the CNC machine will eventually stop or continue producing defective products. Generally, CNC machine tools can be evaluated by the following points: the surface condition of the stone such as image clarity, color, burn mark, etc. These are the points that are also checked by conventional machine tools but the biggest difference is that during polishing, conventional radial arm polishing can change the polish settings according to the look of the surface, whereas CNC tools are continuously exerted. This tool is particularly suited to polishing engineering stone on CNC polishing machines produced by Intermac and Bavelloni. Segments have 8 grooves (L8) to spread the water flow; in addition, 90K (standard), 45K, and 60K angled versions are also available. However, the angled versions cannot be used on contemporary both flat and edge surface. Both snail-lock and magnetic attachments are available. 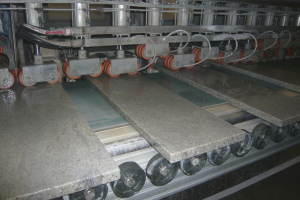 This product is mainly intended for CNC polishing of kitchen tops, vanity tops, and drain boards. This tool is particularly suited to polishing granite on CNC polishing machines produced by Intermac and Bavelloni. Two kinds of segment configurations are available, 4 grooves (L4) and 8 grooves (L8), to spread the water flow; in addition 90K (standard), 45K, 30K, and 60K angled versions are also available. Both snail-lock and magnetic attachments are available. This product is mainly intended for CNC polishing of kitchen tops, vanity tops, and drain boards. Available as Black, White, and NP, this finishing tool is used to produce a shiny gloss. Buff Black is for colored material; White, white material; and NP, marble. .